Scuba diving with sharks is one of the must do dives for most divers and Australia offers plenty of opportunity to tick this experience off your bucket list. 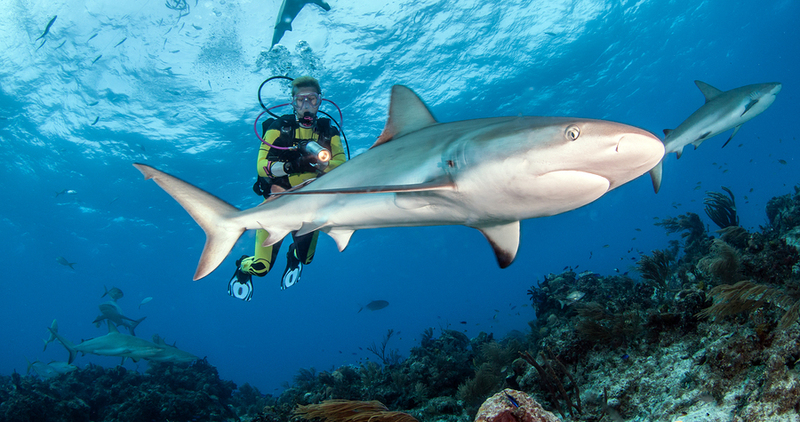 Here is our hit list of Australia’s top shark diving destinations. Let’s start with the big! Snorkelling or diving with whale sharks can be done in Western Australia, Exmouth. Get into a cage whilst participating in a Great White Shark expedition ex Port Lincon in South Australia, a truly thrilling adventure. Grey Nurse Sharks are the Labradors of all sharks and South West Rocks is the place to dive with them all year round. Whilst woebegone sharks can be encountered all year round, the leopard sharks visit the Gold Coast during the summer months. During the winter months, the Grey Nurse Sharks visit 9 Mile Reef, a site just off Fingal Heads in New South Whales. Wolf Rock is home of Grey Nurse Sharks all year round. A fantastic place to encounter huge numbers of sharks, almost guaranteed. The Great Barrier Reef is home to lots of smaller sharks such as white tip reef sharks or black tip reef sharks which are encountered on many dives.